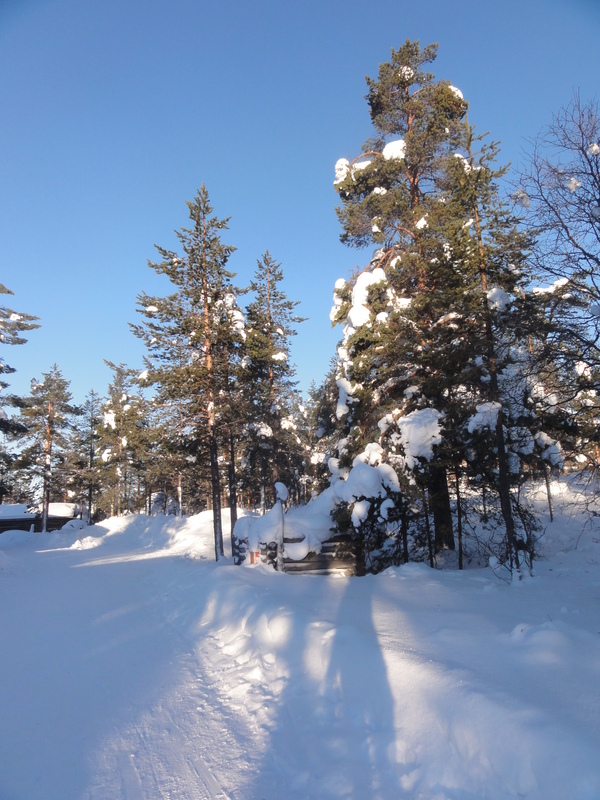 On our last day in Kakslauttanen, the sky was cloudless and bright. All day long. And – you guessed it – the aurora forecast was a strong 4. I was ready to shell out a few hundred euro and stay on another night, cancelling our booking in Helsinki, but Jamie calmly intervened and said no. Our flight didn’t depart until after 7:30pm, so we spent the day doing our favourite free activity: walking. 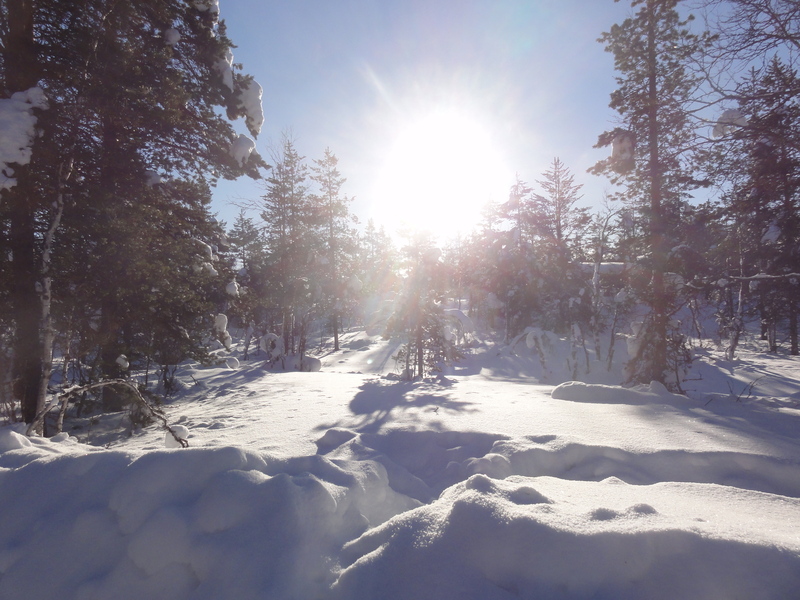 There’s something about a quiet wood blanketed in snow that makes me feel young again. I know I’m not old – 28 is hardly old – but winter brings out the silliness in people. Jamie and I spent the afternoon pushing each other into snowbanks and slip-sliding past cross country skiiers. We awaited our airport shuttle in the abandoned piano bar, playing chess and eating ham sandwiches. A clear day to send us on our way. Thanks a lot, Finnish weather. 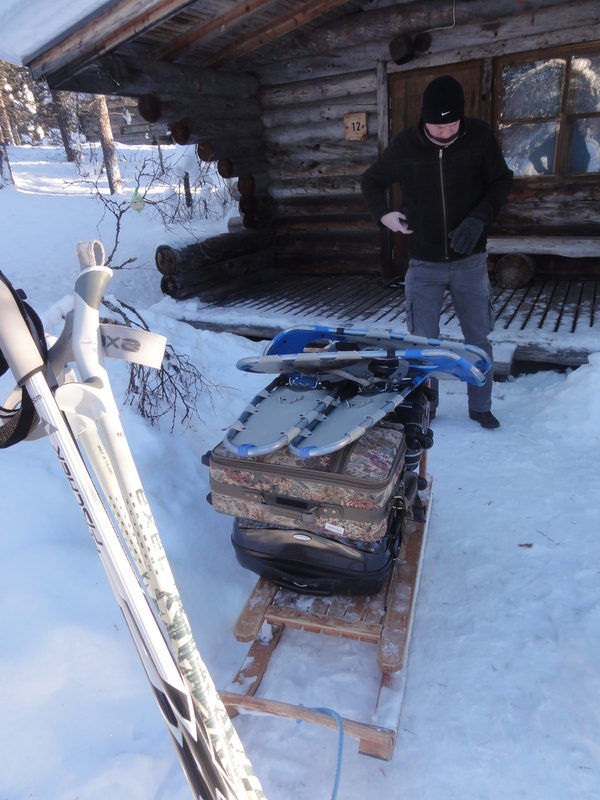 Loading our things into the sled. This place is gorgeous. Get on a plane. Now. 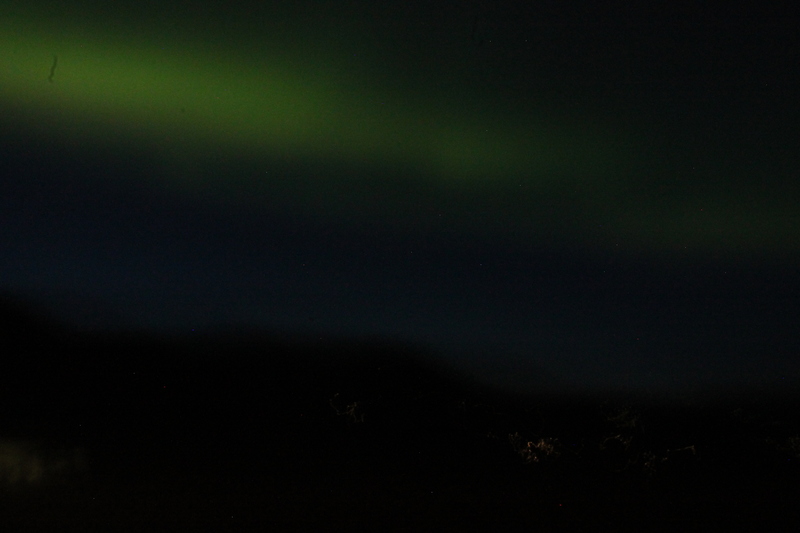 As we drove past the fleeing Finnish landscape to the airport, the sky darkening overhead, I clung to that last bit of hope that perhaps I’d glimpse the northern lights from the airplane. We had a connecting flight in Kittila, which meant more time in the darkening arctic, and already the sky was an optimistic shade of navy. And it’s hard not to be optimistic when you’re sitting in Ivalo Airport. I know I raved about it earlier, but really. The place is more like a log cabin designed by very wealthy lumberjacks who weren’t sure what to do with their money. With just two gates, there is no hassle, and you pass your time gazing out a wall of windows onto a modest and snowy runway. Icicle lights dangle in the corridors. Taxidermied birds dangle from twine overhead. It’s not a bad place to spend an hour. Our flight to Kittila yielded no results. I was in the last row again, pressed up against the window, willing the world to be dark. We landed in Kittila and a few people boarded the plane while others got off. Once we were off to Helsinki, I was back at my window. It doesn’t sound difficult, looking out a window, but trust me. You have to be committed. For one thing, the cabin lights were bright and glaring, so I had to form a cup around my eyes to block out light. My corneas were practically smeared on the glass. And then there’s the unnaturally twisted position you put your body in. It’s not exactly comfortable. But it was worth it when, about the time we finished our ascent and reached cruising altitude, I spotted a hazy green diamond off to the north. With hope, I stared at it until it shimmered and exploded into a wavering line. At first, I wondered if I had hallucinated it in desperation, but soon the pilot announced that indeed, the aurora was visible from my side of the plane, and he mercifully dimmed the cabin lights. As I watched them dance – their pattern resembles the snow kicked up behind a downhill skier, I’ve decided – I debated pressing my phone to the glass to try and capture them. But that would mean rummaging through my bag instead of watching the show. That’s the thing about the northern lights – they’re unpredictable. One minute they’re bold and bright and unmissable, the next they’re gone, dissolved into the darkness. They are not worth missing for a second (though I did let Jamie occupy the window a few times). I watched until we were too far south to see them, and then returned my head to a normal angle. 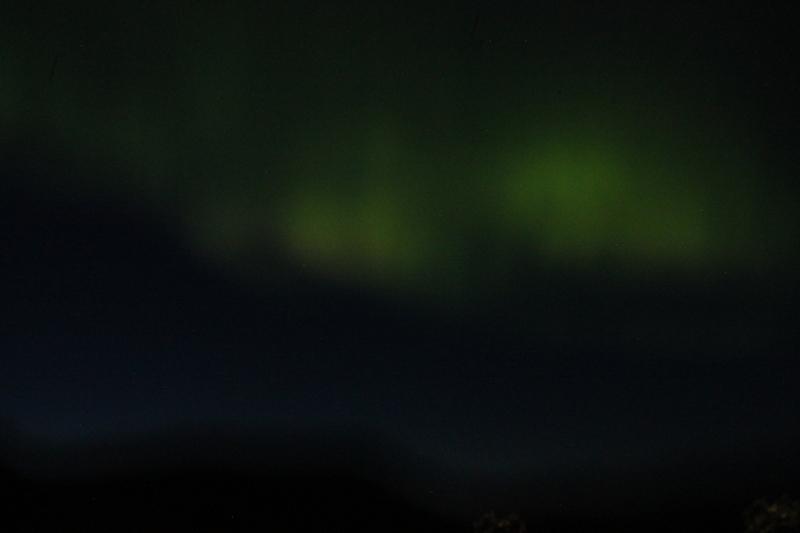 Here are some blurry northern lights photos I took in Iceland. They basically looked the same from the plane window.